Steel furniture to melt your heart! One thing is becoming clear to me. The French know how to do things well, designing pieces that last the distance, fitting in with various fashions and it should come as no surprise, after all the term avant-garde is French, isn’t it? History shows us that French company Tolix have always been fashion-forward. 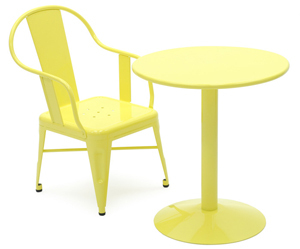 They’re famous for their iconic ‘A chair’, originally made in the 1930s and still much sought after today. It’s with a big thanks to our reader Rosanna for letting us know a children’s range is launching this year! Tolix make furniture from sheet metal, which gives the feeling that it will be cold and industrial-like but it’s actually the exact opposite. Beautiful curves have been created and gorgeous splashes of colours really modernise and warm the pieces up. There are several stunning pieces in the Tolix children’s range and though they’re all impressive, my favourite is the Armadillo Coat Peg. I have a vision of blasts of orange spheres gracing a bold coloured wall that I’d love to turn into reality! Check the Tolix website for a distributor here in Australia.